We all need to relax. Games like Journey have done a great at that, transporting us to different worlds while being easy on the mind. InnerSpace was a game that had the promise of that, but sadly its biggest issue is that it is not fun and now I’m going to break it down for you, to explain why. 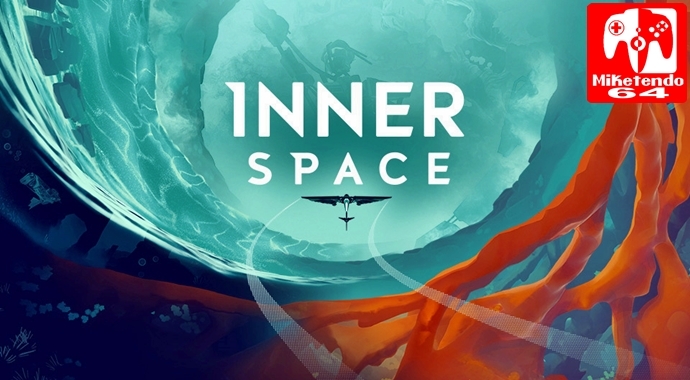 InnerSpace is a game that was on Kickstarter and that was apparently successful (though I have no remnant of its Kickstarter page to confirm this). It’s a game where you take control of a cool looking flying machine to explore the Inverse. You first hear the story of the Inverse. The Inverse was inhabited by the Ancients who used the power of wind until the demigods came in and started destroying it. The Ancients were unable to leave it and disappeared. It then starts out with you, the flying machine, waking up after being built. This person called the Archeologist tells you that he and you must explore the Inverse. Early on, you come to learn that this quest was given so you can preserve the memory of the Inverse. I like this. I think it’s very touching and gives meaning to what you do. Preserving the memory of this place really motivates you to explore. As you explore, you’ll gain relics to upgrade your ship (for going underwater…), and they serve to preserve the memory of the Inverse as well. So gameplay wise? Well, it’s its main flaw. I didn’t find the gameplay fun. An open world airplane game is a great idea on paper but in my opinion should stay on paper. Let me explain. See the objectives are repetitive. Basically all you do find relic parts to build a relic which upgrades your ship. That’s it. In itself, it doesn’t sound too bad but for a game meant to be original and “journey within”, it’s disappointing. Had there been varied objectives it could’ve been better. Even simple ones to keep diverse. The worlds aren’t so big as well and it’s by section. Here’s one thing that tends to annoy me, when people say their game is open world but it isn’t. You have to find these annoying relics to explore this beautiful world that’s limited. You move from one place to another. The worlds look big but by flight they are small. If you had been the size of the Archeologist sure they are huge, but from a bird’s view, they are average. Especially since it’s divided into sections. One last criticism before we move to positives: the controls. They start with inverted flight controls, and you can’t change them until you finish the tutorial. Then either it’s because I’m not good with flying games, or it’s the controls that aren’t good. They are precise for sure but I found them difficult to master. Making sharp turns, turns out to be hard. For a game meant to relax and transport you I don’t think complex controls are a must. If you’ve ever used a drone or an RC helicopter with two handles, it’s like that but it feels even harder. Especially since there’s a bunch of tight spaces and obstacles that require precise movement early on. Luckily it’s hard to die. I did an experiment where I deliberately tried to die and it took a while. I like that move. Really isn’t punishing mistakes. On to the positives though! Even though gameplay suffers there is still some good here. This game looks great! You can really tell they put effort into making this game bright, colorful and just a joy for the eyes. The color palette and textures/models are made just to relax your eyes and enjoy this world. It’s really quite something. The worlds are gorgeous and even though are small and not interesting are beautiful. They look so good! There are pretty sights to see! Another positive is the message: it’s all about the journey, not the destination. The whole point of the game is the journey inside the Inverse, there’s no destination. It shines so bright here, but ultimately, despite a good start, the gaming experience did not end the way I thought it would. There are some good here. Really visually, it’s a feast for the eyes and it’s a great way to relax. The problem is visuals aren’t everything. While some might enjoy the gameplay, I didn’t. It just isn’t fun. The objectives aren’t fun and they are repetitive. An open world airplane game just doesn’t work well.